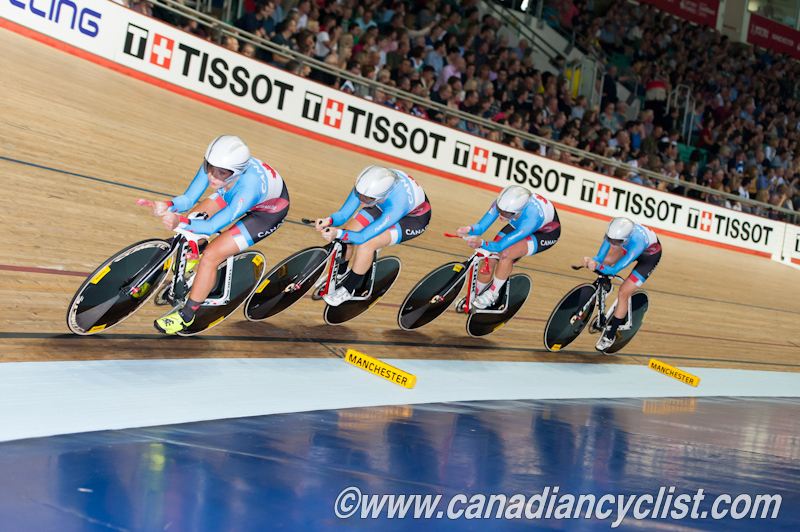 The Canadian Women's Team Pursuit squad started the 2014 UCI Track Cycling World Cup on the right note, earning the silver medal in Manchester, England. In doing so, the four-woman team breaks the Canadian record, posting a time of 4:27.083. In the morning qualifying session, Canada moved into the gold medal race with the second fastest time of 4:28.0, behind the Olympic and World Champion team from Great Britain. Great Britain went on to win the gold medal in the Final with a time of 4:19.604, smashing the World Record time previously set earlier in the day by that same team, while Australia rounded the podium with a time of 4:30.831 in the bronze medal race against Russia. The event marked the first time the Women's Team Pursuit race has been disputed over the 4000 metre distance at the World Cup level. The Canadian team is comprised of Gillian Carleton (Victoria, BC), Laura Brown (Calgary, AB), Allison Beveridge (Calgary, AB), Stephanie Roorda (Vancouver, BC) and Jasmin Glaesser (Coquitlam, BC). At the 2012 Olympic Games in London, Canada's team won the bronze medal with Tara Whitten, Gillian Carleton and Jasmin Glaesser in the line-up, which at the time was a three-woman team. "I'm very pleased and proud of the riders in the qualifying ride. Everyone executed well which resulted in the time we were expecting," said Craig Griffin, the Canadian team's coach. "We rode a second faster than qualifying, losing Jasmin before 3 kilometres, which is not typical of her but understandable considering where she was five weeks ago. Laura and Steph had great rides, specifically Steph, who has definitely stepped it up a couple of notches. With a solid Jasmin we are 1.5 seconds quicker. Plenty of improvements to make, so that's encouraging." Laura Brown said "It was really exciting to be on the start line today as a team of four with the new 4 kilometre race format." The World Cup continues Saturday with Hugo Barrette (Cap-aux-Meules, QC) racing the Keirin race. The women's Points Race will be featured on Sunday with Canadian riders Laura Brown and Jasmin Glaesser taking part in the event. Barrette will also take part in the Sprint event on Sunday, while Gillian Carleton will race the Omnium.